Continuing in this series, I now want to take a short break from referencing Eusebius' interpretation of Old Testament prophecies, and provide some historical information about those events which he argues were fulfilled within the generation of the Apostles. Although Eusebius was a comprehensive biblical exegete, he is actually more famous for being an excruciatingly detailed historian. 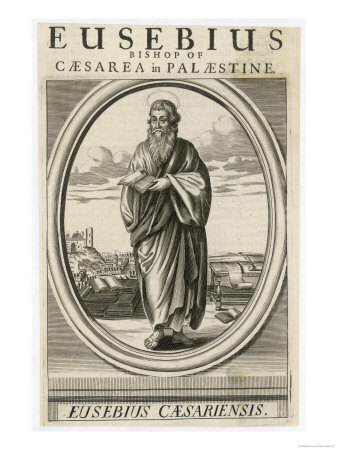 As I noted in a couple posts, Eusebius is considered to be "the Father of Church History." For those unfamiliar with his historical works, over the next few posts I will be offering a few selections from those which will help clarify what first century events he thought clearly illustrated the fulfillment of Scriptural promises about the end of the Old Covenant administration and final judgment upon the Jewish nation in 70 AD. Tiberius died after having reigned about twenty-two years, and Caius, receiving the empire next, immediately conferred the Jewish government on Agrippa, appointing him king over the tetrarchy both of Philip and Lysanias. To these, not long after, he adds also the tetrarchy of Herod, after having inflicted the punishment of perpetual exile upon Herod, together with his wife Herodias, for their numerous crimes. This was the Herod who was concerned in the passion of our Saviour. Josephus bears testimony to these facts. During the reign of this emperor, Philo became noted, a man most distinguished for his learning, not only among very many of our own, but of those that came from abroad. As to his origin, he was a descendant of the Hebrews, inferior to none at Alexandria in point of dignity of family and birth. As to the divine Scriptures, and the learning of his country, how greatly and extensively he laboured, his work speaks for itself. And how well skilled in philosophy and the liberal studies of foreign countries, there is no necessity to say, since, as he was a zealous follower of the sect of Plato and Pythagoras, he is said to have surpassed all of his contemporaries. Thus far Josephus. And Philo himself, in the embassy which he describes, details the particulars of what was then done to him, with great accuracy. Passing by the greatest part of these, I shall only state those by which it will be made manifest to the reader, that these things happened to the Jews forthwith, and at no distant period, on account of that which they dared to perpetrate against Christ. First, then, he relates, that in the reign of Tiberius, at Rome, Sejanus, who was then in great favour with Tiberius, had made every effort utterly to destroy the whole nation of the Jews, and that in Judea Pontius Pilate, under whom the crimes were committed against our Saviour, having attempted something contrary to what was lawful among the Jews respecting the temple at Jerusalem, which was then yet standing, excited them to the greatest tumults. “So great was the caprice of Caius in his conduct towards all, but especially towards the nation of the Jews. As he was excessively hostile to these, he appropriated their places of worship to himself in all the cities, beginning with those at Alexandria, filling them with his images and statues. For having permitted it when others erected them of their own accord, he now began to erect them by absolute command. But the temple in the holy city, which had been left untouched as yet, and been endowed with privileges as an inviolable asylum, he changed and transformed into a temple of his own, that it should be publicly called the temple of Caius the younger, the visible Jupiter”. Many other and almost indescribable calamities, the same author relates, as happening to the Jews of Alexandria, during the reign of the aforesaid emperor, in his second book, to which he gave the title, ‘On the Virtues.’ Josephus also agrees with him, who likewise intimates that the calamities of the whole nation took their rise from the times of Pilate, and the crimes against our Saviour. Let us hear, then, what he also says in the second book of the Jewish War. The same writer mentions innumerable other commotions that were raised in Jerusalem beside these;2 showing that from that time tumults, and wars, and plots of mischief, one after another, never ceased in the city and all Judea, until, last of all, the siege of Vespasian overwhelmed them. Thus, then, the divine justice overtook the Jews in this way, for their crimes against Christ. It is proper, also, to observe, how it is asserted that this same Pilate, who was governor at our Saviour’s crucifixion, in the reign of Caius, whose times we are recording, fell into such calamities that he was forced to become his own murderer, and the avenger of his own wickedness. Divine justice, it seems, did not long protract his punishment. This is stated by those Greek historians who have recorded the Olympiads in order, together with the transactions of the times. Caius, however, had not reigned four years, when he was succeeded by Claudius, in the sovereignty of the empire. In his reign there was a famine that prevailed over the whole world;3 an event, indeed, which has been handed down by historians far removed from our sentiments; and by which the prediction of the prophet Agabus,4 recorded in the Acts of the Apostles, respecting the impending famine over the whole world, received its fulfilment. Luke, however, in the Acts, after stating the famine in the time of Claudius, and after recording how, by means of Paul and Barnabas, the brethren at Antioch had sent to those of Judea, according to the ability of each one, also adds the following. Of this James, Clement adds a narrative worthy of note, in the seventh book of his Institutions, evidently recording it according to the tradition which he had received from his ancestors. He says, that the man who led him to the judgment seat, seeing him bearing his testimony to the faith, and moved by the fact, confessed himself a Christian. Both, therefore, says he, were led away to die. On their way, he entreated James to forgive him, and James, considering a little, replied, “Peace be to thee,” and kissed him; and then both were beheaded at the same time. Then also, as the Scriptures say, Herod, at the death of James, seeing that the deed gave pleasure to the Jews, also attacked Peter, and having committed him to prison, had well nigh executed the same murderous intention against him, had he not been wonderfully delivered from his prison by an angel appearing to him at night, and thus liberated to proclaim the Gospel. Such was the providence of God in behalf of Peter. Thus far Josephus: in which statement, as in others, so in this, I cannot but admire his agreement with the divine Scriptures. But if he should appear to any to differ, in regard to the epithet of the king; yet the time and the fact show that it was the same individual, whether it happened by an error in writing that the name was changed, or in consequence of a double name applied to him; such as was the case with many. As Luke in the Acts, also introduces Gamaliel in the consultation respecting the apostles, saying, that at this time “arose Theudas, who gave out that he was some one, but who was destroyed, and all that obeyed him were dispersed,” let us now, also, add the written testimony of Josephus respecting the same circumstance. He relates, in the book already quoted, the following particulars. Besides this, he also mentions the famine that took place under Claudius, as follows. "About this time it happened that the great famine took place in Judea, in which also queen Helen having purchased grain from Egypt, with large sums, distributed to the needy." You will also find this statement in accordance with that in the Acts of the Apostles, where it is said, that according to the ability of the disciples at Antioch, they determined, each one, to send to the assistance of those in Judea. Which also they did, sending to the elders by the hands of Barnabas and Paul. Of this same Helen, mentioned by the historian, splendid monuments are still to be seen in the suburbs of the city (i.e. Jerusalem) now called Ælia. But she is said to have been queen of the Adiabeni. 1 Alabarch. The Alabarch was the chief magistrate among the Jews at Alexandria. 2 In Matthew 24:6, Jesus prophecies: "And you will hear of wars and rumors of wars. See that you are not alarmed, for this must take place, but the end is not yet." 3 Matthew 24:7, Jesus prophecies: "For nation will rise against nation, and kingdom against kingdom, and there will be famines and earthquakes in various places. All these are but the beginning of birth pains." Valesius. (1847). Life of Eusebius Pamphilus. In Parker S.E. (Trans. ), An Ecclesiastical History to the 20th Year of the Reign of Constantine (pp. 73–81). London: Samuel Bagster and Sons.